The best SSB CB radio will give you more reach than a standard CB radio, but selecting the right model is essential. If you already have a high-quality CB and want to upgrade to something more powerful, a Single Side Band model is a good pick. We understand how difficult it is to identify the highest quality SSB radios without blowing your budget, so we created this convenient guide to point you in the right direction. We hope to answer your questions while offering professional insight through honest CB radio reviews. 3.1 Do You Need an SSB Radio? Are you struggling to find the best SSB CB radio? We can help you out with trustworthy reviews of three leading SSB radio models. If you have some technical CB knowledge or are willing to spend more time learning how to use advanced features, you may consider the Galaxy DX 959 an excellent SSB CB radio for you. It's also a good pick for anyone interested in maximizing functionality while staying under the $200 mark. We were instantly impressed by the oversized display. The numbers are large enough to see easily, and the yellow coloring stands out in all lighting. The advanced noise filter on this radio limits static and background noise for crystal clear reception. There are also a variety of additional features that help to improve the clarity and overall quality of transmissions. We rank the Uniden Bearcat model as one of the best overall CB radios, but it's also one of the best SSB CB radios. In addition to offering extended channel options, it delivers a range of advanced features that allow you to maximize functionality. RF gain is a feature that adjusts the sensitivity of the radio, reducing noise considerably. ANL, also known as auto noise limiter, works with the noise blanker to reduce interference and improve clarity of transmissions even further. The Bearcat even comes with a noise-cancelling microphone. You can also invest in the BC906W cordless microphone if you want to upgrade to a hands-free model. Finally, we were impressed with the large display on this SSB CB radio. It allows you to choose from seven backlighting color options. Standard CB radios and SSB radios don't mix well, so we like that the AnyTone AT-5555N SSB radio is easily modified into a standard CB system if needed. We also appreciate the large LCD display that shows more than just the channel number. With one glance, you can see a variety of data at any moment. This radio also has some advanced features, including RF gain control. This is a sensitivity feature that will help eliminate some of the static and interference picked up by the surrounding environment. Many users also like the overall look of this SSB radio. It's also quite durable and rugged, especially compared against some competing CB radios. If you've read our buying guides for the best CB radio or the best handheld CB radio, you may recall us pointing out that CB radios can go up to hundreds of channels if you consider the side bands. If you've been wondering how you reach those added channels to maximize your reach, you're ready to discover the SSB CB radio. SSB stands for single side band. In addition to accessing the 40 standard CB channels, these radios can pick up sub channels that go much further than your local area. It's important to keep in mind that CB radios can legally reach up to 155 miles, but some of the best SSB CB radios can reach much further if used properly. Do You Need an SSB Radio? 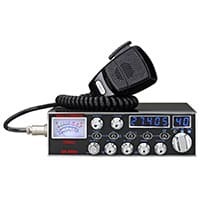 You will notice when reading our CB radio reviews that SSB models are a bit more expensive. Some of the best models start around $200, but we will introduce you to one that is closer to $100 in our review section. Whether you need to invest more money for the extended range depends on how you intend to use your CB radio. If you primarily want to access the weather channels and emergency broadcasts, then you won't need the extended power of an SSB radio. If you're a radio enthusiast who wants to push the limits of the CB network, then you may decide that a high-quality SSB radio is essential. On the other hand, someone who only wants to connect with local CB users or who has a more restrictive budget may stick with a standard mobile or portable CB radio. Many of the features on an SSB radio are the same as those on a standard CB radio. You want to look at the backlighting on the display to make sure it's easy to see in all lighting, and the quality of the microphone is important. You may also look at the advanced features like squelch control and noise limiters to cut down on static and interference. If you have some technical knowledge, you may also want to consider frequency counters and SWR circuits. The best way to start shopping for an SSB CB radio is to read the CB radio reviews included in this guide. We'll point out the pros and cons of three leading models, guiding you toward the right radio for your personal needs. If we had to choose one of our reviewed products as the best SSB CB radio, we would select the Galaxy-DX-959. It sells at a reasonable price, offers a variety of advanced features and has a large display that is easy to read even while driving.